Like most objects, books are confined to the space they occupy, obedient as they are to the laws of nature. That is to say, unlike the Incredible Hulk, they do not normally expand beyond the limits of their own physicality. This post will challenge your beliefs if you agree with this statement. 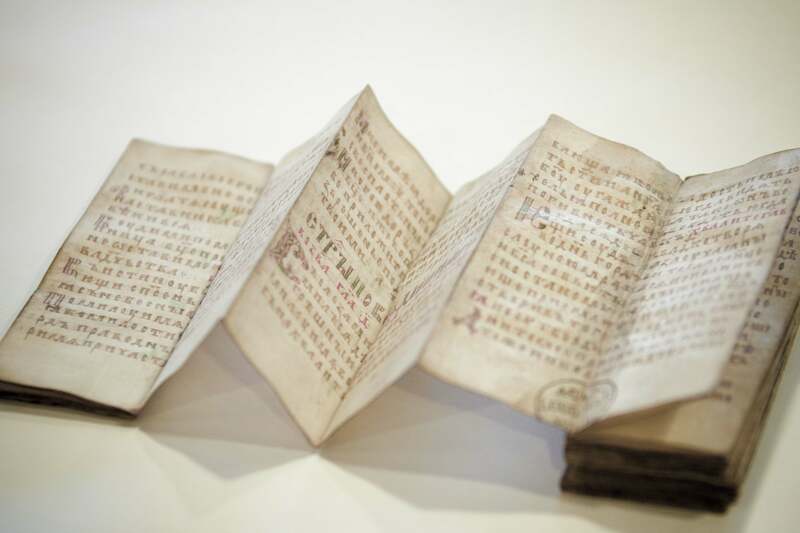 It draws attention to types of medieval books that do expand beyond their physical limits: with a flick of the finger or a gesture of the hand the dimensions of these special objects increased dramatically, up to ten times their original size. As if defying the laws of nature, this miraculous expansion increased the available writing space in objects that were principally designed to be small and portable. The examples in this post suggest that this given of “doing more with less” was an important drive behind the clever design of expandable books. If you are a frequent reader of this blog, you are no stranger to small books made for portability. The same goes for the almanac seen in Fig. 1. Produced in England in 1415-1420, it contains a calendar as well as astrological tables and diagrams. The information was used by physicians to diagnose and prognosticate, while the calendar provided information about feasts. Most of these almanacs, some thirty of which survive, look more scruffy than the pretty specimen in the Wellcome Library, which may not have seen much practical use (more here). 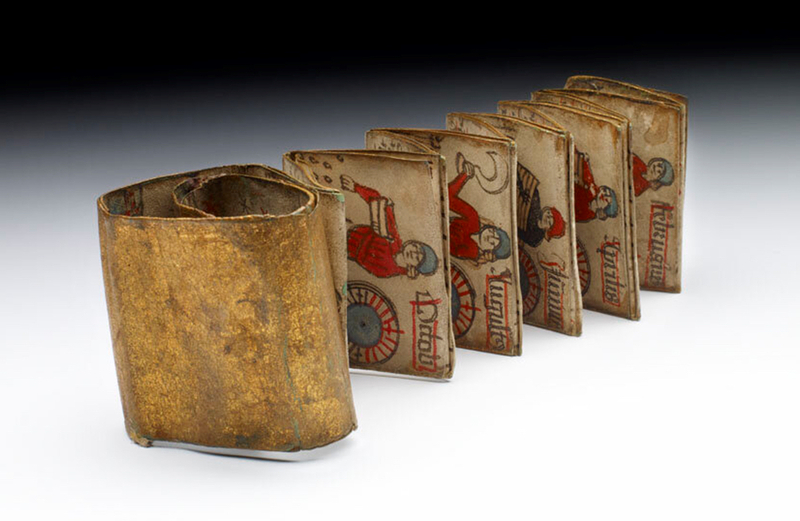 Folding almanacs were especially popular in late-medieval England, assuming surviving specimens form an accurate representation. The objects are particularly interesting from a material point of view. 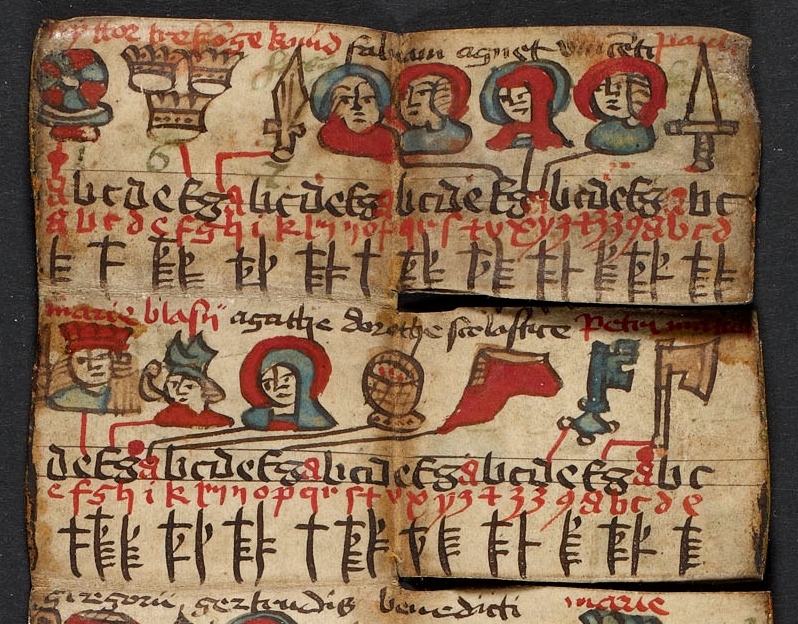 During production the folding almanacs looked very much like a regular book: the scribe filled regular pages with text. However, in a completed state, when the binding was added, the pages were folded in a very clever way, giving the object an “unbookish” look. The precise manner of folding differed, as Figs. 1-2 show. Both fold in three steps, but the folding sequence is different. The leaves ‘sit’ different too. The specimen in Fig. 2 seems more prone to damage than the other almanac, because the expanding part (the four zones that are slightly lighter) are attached to the actual book by means of a delicate hinge. Both almanacs above provide six times more writing/reading space in their expanded form, which is quite amazing. However, this is still considerably less than another type of expandable manuscript: the accordion book. Fig. 3 shows illustrated specimen (a calendar) made in Denmark in 1513. 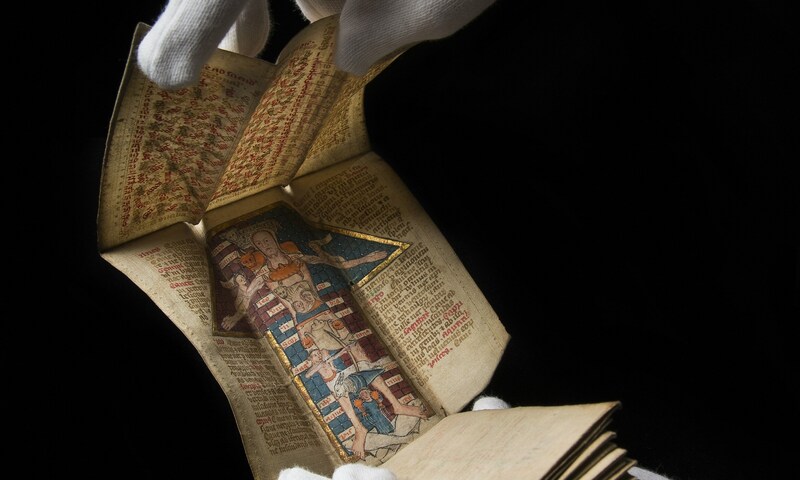 While in its folded state the object is as small as a matchbox, it expands to a full page of considerable proportions, comparable to a regular-sized medieval book (more information here, facsimile here). 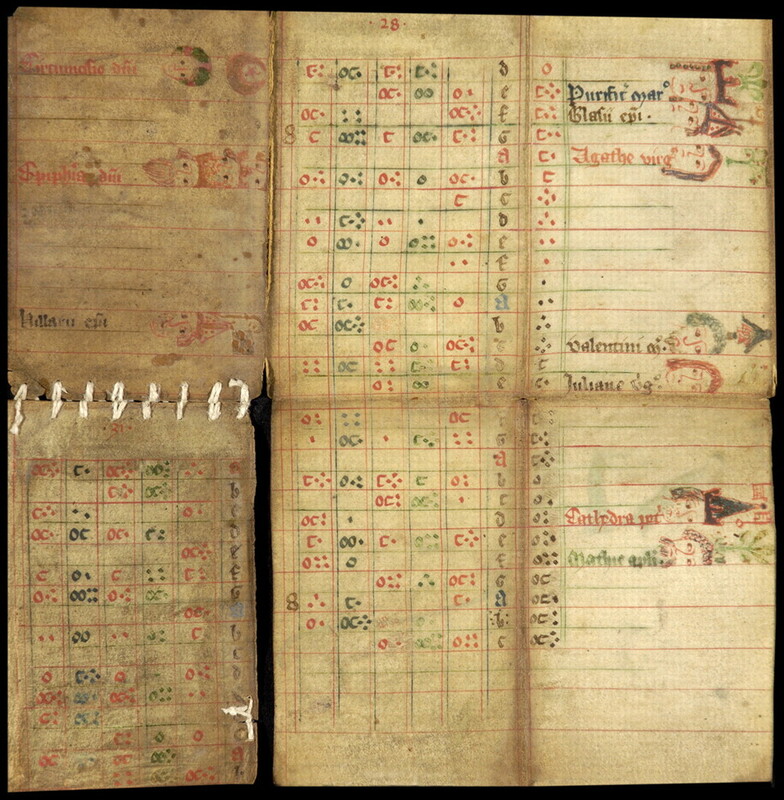 Curiously, the calendar has a most unusual way of unfolding: sections of the sheet expand independently, like little flaps from a pop-up book (note the “incisions” on the right half of the object, as seen in Fig. 4 – full image here). The Copenhagen accordion book is a very small portable object. Even though in its expanded state it became much larger, due to the limited size of the object in its folded state, the expansion produced a relatively small writing/reading surface. The remarkable thing about accordion books, however, is that their surface space could be considerable, even when the actual object (in its folded state) was still of modest proportions. My own Leiden University Library owns a copy from fourteenth-century Russia which is only 120 mm in height. The whole thing resembles the dimensions of an iPhone (Fig. 5). In expanded state, however, the book becomes no less than 3750 mm wide, meaning that the surface actually increases by an astonishing factor of ten. It is hard to say what the upside is of this book format. After all, if the same pages had been bound in a regular (non-accordion) fashion, it would accommodate the same amount of text. Perhaps the format was favoured because of a certain ease of use? It is easier, for example, to access the information in the book without using one’s hands. Also, without flipping any pages, the reader had access to a great deal more than the usual two pages of a book opening, which may perhaps have been handy in certain modes of use. 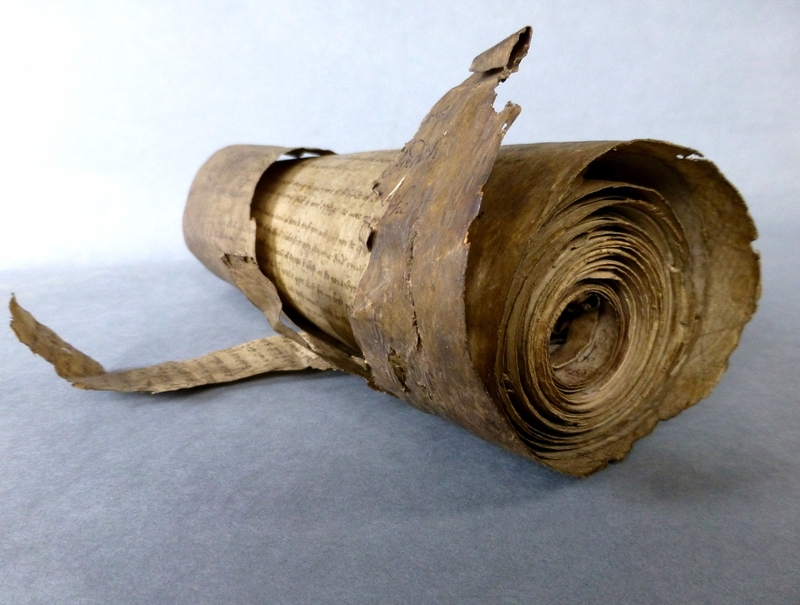 What looks like a cigar, is actually the most common and oldest expandable bookish object: the roll (Fig. 6). This object probably held the most information in relation to its dimensions. Rolls had been in use for a long time when the book finally came around in the fourth century (see my post What is the Oldest Book in the World? and more information on rolls here). During the Middle Ages the roll format remained in use longest in administration. It was not until the late thirteenth century, for example, that cities in North-West Europe switched to the book form to write down their income and expenses – the city of Bruges still used rolls for this purpose in the 1280s. Rolls can be quite long. 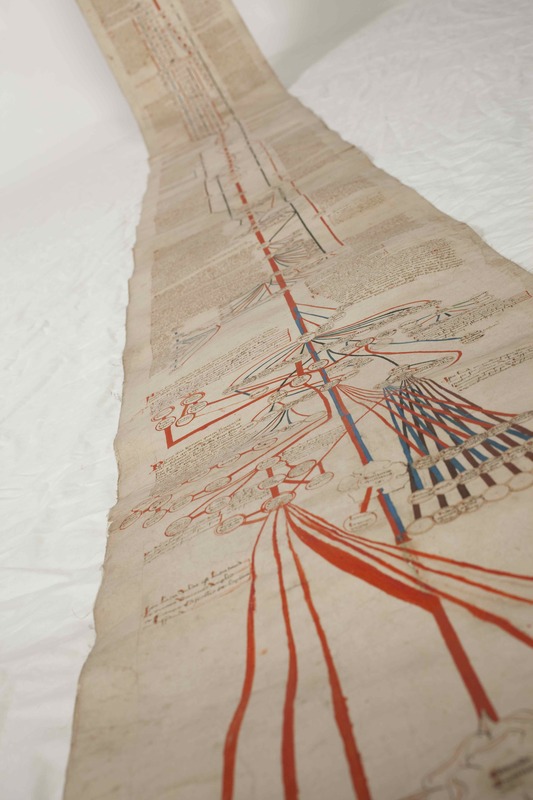 One of the longest that survives from the medieval period is a mortuary roll that was carried to 253 monasteries, nunneries and cathedrals across England and France during the 1110s (source). Mortuary rolls were produced to commemorate the death of a prominent person, in this case Abbess Mathilda of Holy Trinity Abbey in Caen. Like writing a joint birthday card today, clerics in France would add their say to the roll, which grew and grew, until it finally reached a length of 22 meters (72 feet). 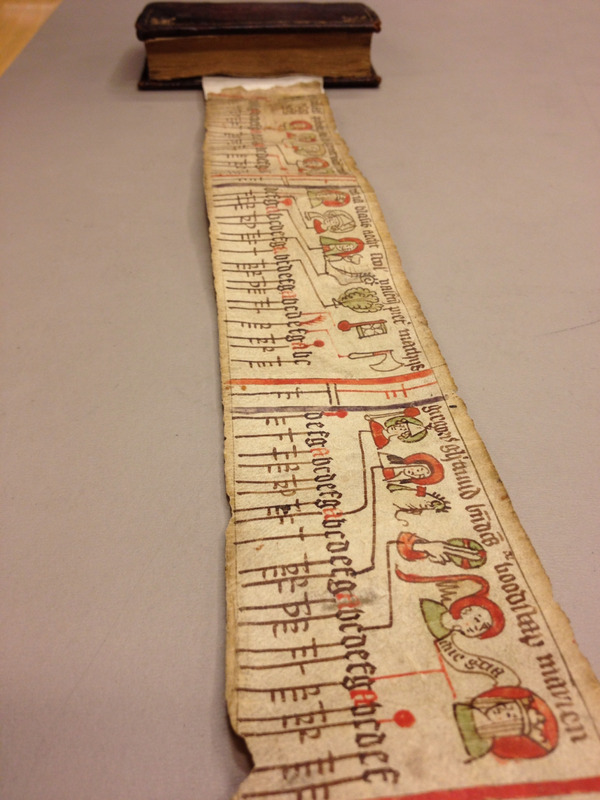 Genealogical rolls could also be quite long (Fig. 7), though not as exceptionally long as the mortuary roll made for Abbess Mathilda. From time to time unusual rolls are encountered, like the one seen in Fig. 8. 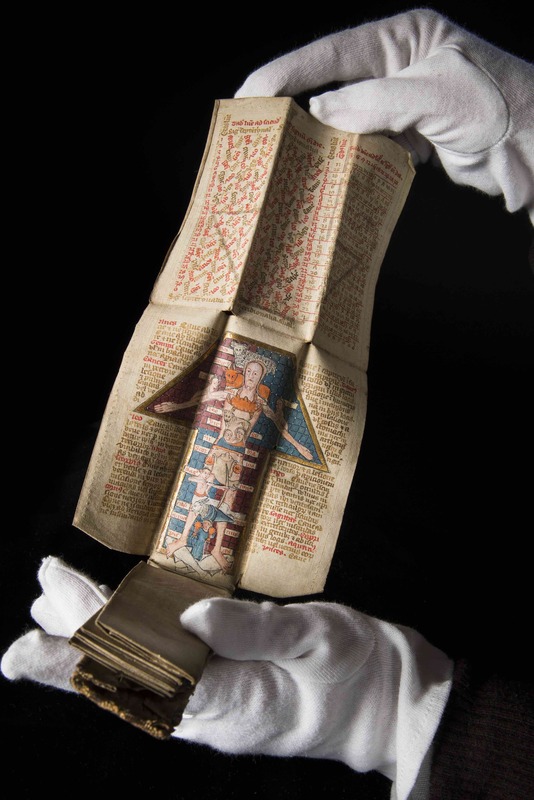 This one is special because the fourteenth-century object comes rolling out of a book (of slightly later date), which functions as its sleeve. The end of the roll (again holding a calendar) is simply pasted onto the book. The full roll measures an astonishing 130 cm (a little over 4 feet). One wonders whether the owner created this remarkable hybrid because it allowed for easy storage on the book shelf. A book placed among its peers, albeit with an unusual content. What the Incredible Expandable Books in this post share is an effort to hold a lot of text in an object that occupies a modest amount of space, usually in one’s pocket. When there is a dire need to take information with you on the go, medieval readers were quite inventive, as my post Bag it, Box it, Wrap it shows. Interestingly, the expandable information carrier lives on in our own day. Not only are there still book designers who produce accordion books in the medieval fashion (like Peter Thomas, whose recent email correspondence inspired this post), but the expandable almanac at the outset of this post has actually become ubiquitous in the form of pocket maps, displaying such things as the layout of cities and underground stations. 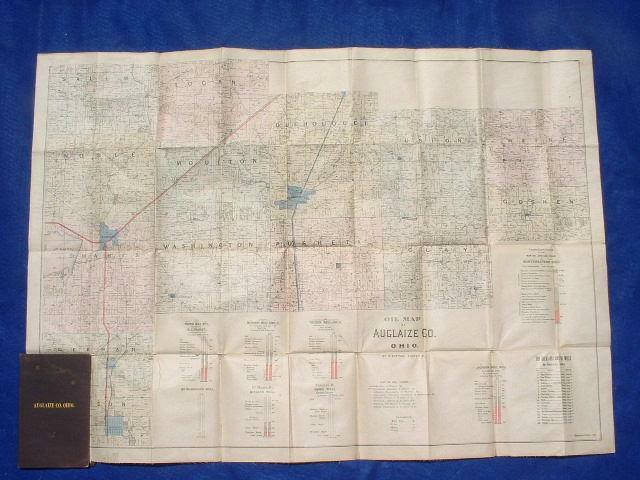 Echoing the roll hidden in a book, some of these maps hide in (and take on the form of) an actual book, like the 1886 edition that shows the location of oil wells (Fig. 9). As with their medieval peers, ease of use and portability are the driving forces behind getting a lot of information in an object with a tiny footprint. “Doing more with less” is clearly a universal urge.